Spread across steep hillsides that overlook the Rio Tejo, Lisbon has captivated visitors for centuries. The amazing vistas reveal the city in all its beauty: Roman and Moorish ruins, white-domed cathedrals, grand plazas lined with sun-drenched cafes. Included is a three night stay in Lisbon. Today you will have an exciting tour of the city center and view some of the famous points, as well as experience the sights of the yellow trams clattering through tree-lined streets. Today enjoy your day at leisure in Lisbon; your tour director is at your service to help you plan your day in this vibrant city. Today travel north along the Atlantic coast stopping at the enchanting town of Nazare, home of one of largest waves in Europe. 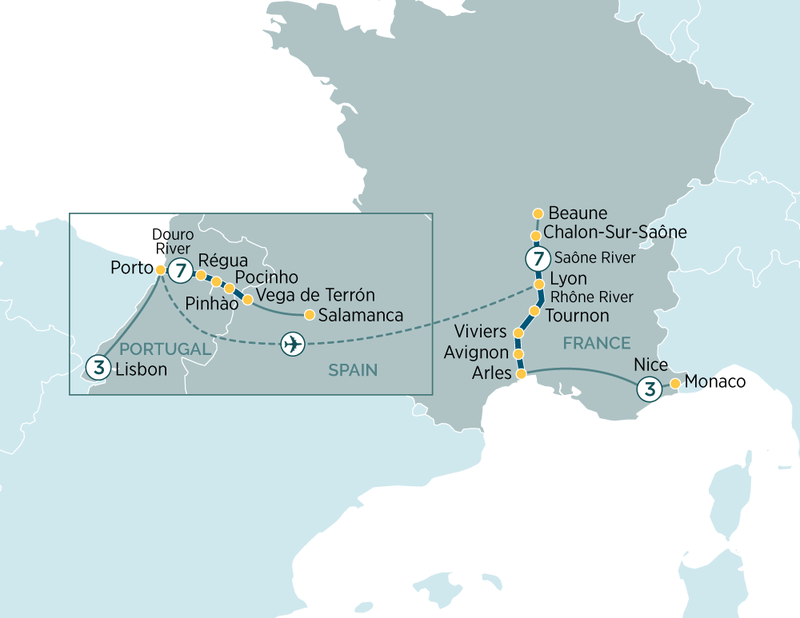 Once in Porto, board your Emerald Waterways luxury river cruise ship. This evening join your fellow travellers for dinner on board. After breakfast disembark your river cruise ship and transfer to Porto airport for your flight to Lyon. In Lyon, you will be transferred to the new ship journey.